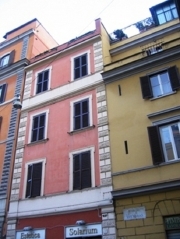 This apartment is located on Largo di Porta Castello, a street very close to the Vatican, the Castel S. Angelo and to Piazza del Risorgimento, a well-known square in Rome, and the last “modern Rome” spot that pilgrims and visitors in general go through before arriving at the Vatican City through Via di Porta Angelica. People from all over the world gather around this square to get to Piazza San Pietro, and every morning groups of all sizes walk along the Vatican Walls in order to get to the Vatican Museums, definitely a must for those who like art – and even for those who do not like it quite so much, the Sixtine Chapel (where new Popes are elected during the conclave) is definitely worth seeing! The area also allows visitors to enjoy all the facilities that modern Rome offers : sensible shopping without having to leave the city centre. As for public transportation, the Ottaviano-San Pietro metro stop (Line A) can be reached in a couple of minutes. A great number of buses also stop at Piazza del Risorgimento, allowing you to get virtually anywhere in the city. This lovely split level apartment is located on the 2nd and 3rd floors of a 19th Century building (lift unavailable). This very quiet apartment is finely furnished with antics, and has wooden floors. On the ground level you will find a living-room with a dining-area and a double sofa bed, an equipped kitchen, and a double bedroom with a Queen size bed (that can be split in twin beds). Please notice that in exceptional cases 1 or 2 children can sleep in the sofa bed, but it is not suitable for adults. On the upper level, there is another double bedroom with a Queen size bed, and a bathroom (with shower). The apartment also has a 45 square metres furnished and covered terrace, with beautiful views on Saint Peter Cathedral Cupola. 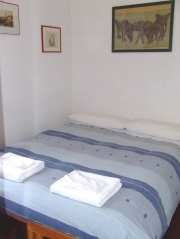 The apartment is provided with AIR CONDITIONING, autonomous heating, a TV set (Italian TV only) and an oven. air conditioning, heating, wooden floors, double glazing, washing machine, fridge, freezer, oven and microwave.